BMRCL is hoping that the daily ridership to increase to five lakh. 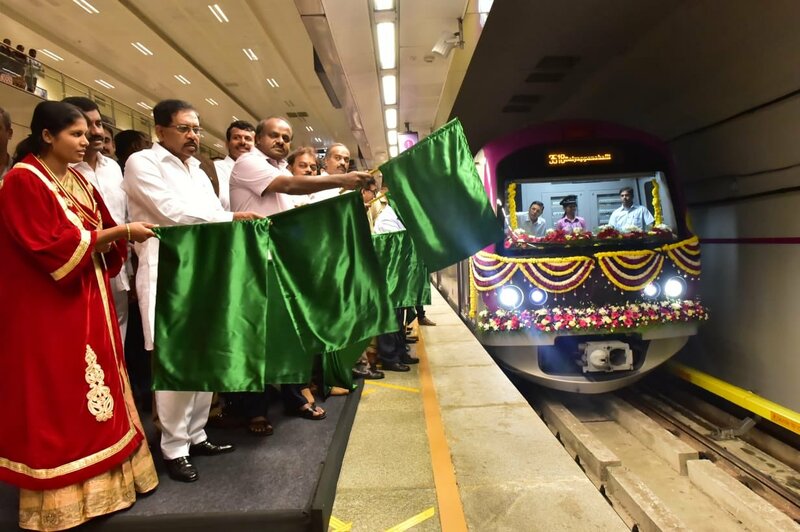 Bengaluru, Metro Rail News: Karnataka CM HD Kumaraswamy on January 28, 2019, flagged off the first six-car metro on the Green Line of the Namma Metro running between Nagasandra in the north and Yelachenahalli in the south of a Bengaluru. On the same day, two more six-car trains were added to the Purple Line which connects Mysore Road and Byapanahalli. Before January 28, 2019, three existing six-car trains were running on the Purple Line. Until June 2018, all the metros running in Bengaluru were of three coaches leading to extreme cramping in peak hours. The six-car trains have a capacity of 2,000 passengers and are currently deployed in peak office hours to prevent cramping. The capacity of three-car trains is 975 passengers at a given time. Other than this the new trains will also have remote isolation features for Variable Voltage & Variable Frequency (VVVF) Inverter through Train Management System along with Pendant Control Operation (Hostler mode) to move individual three units of six car train set on self-power (unique feature) in case of emergency. Other unique features of these trains include split screen in LCD panel in continuous advertisement display without disturbing the passenger information, remote downloading of train data for maintenance purpose. With the additions of six-car trains, the Bangalore Metro Rail Corporation Limited expects the ridership to increase to five lakh from an average ridership of daily average ridership of four lakh passengers along its total 42-km network. While the first coach is reserved for women passengers for six-car trains in moving direction, the first two gates of three-car trains are for women-only. Top officials of the BMRCL expect that in future when all the metros in the city will be converted to six-car trains, such segregation won’t be required. According to source By September, all 50 trains of Namma Metro will be converted to a six-car train.